I’ve had the privilege of speaking on topics that range from medical humanities, story as a clinical skill, creative writing, strategies to incorporate writing into a medical career, and medical ethics. I’ve also given presentations that have included selected readings from my work as a jumping off point for group dialogue on a number of issues, including end of life, social determinants of health, caregiver frustration, physician bias, wellness, making mistakes, medical training, and nonmedical challenges facing clinicians. I’m also available for book club discussions or classroom conversations. I’m committed to working with institutions or conferences to better understand how my visit can meet the needs of their students or audience. by MK Czerwiec, a.k.a "Comic Nurse." 3/22/2019 “Can we write a better story for ourselves?” Plenary 6th National Nursing Ethics Conference, Los Angeles CA. 3/22/2019 “Working with Uncertainty” Workshop, 6th National Nursing Ethics Conference, Los Angeles CA. 11/12/2018 Medical College of Wisconsin School of Medicine Annual Humanities Lectureship “Why we need more creativity in medicine.” Milwaukee, WI. 5/3/2018 "Welcoming Crises: Storying into Medical Ethics," McGovern Center for Humanities and Ethics, University of Texas at Houston Medical School. 10/8/16 Panel, "Using social media to advance public literary in bioethics." American Society for Bioethics & Humanities meeting, Washington, DC. 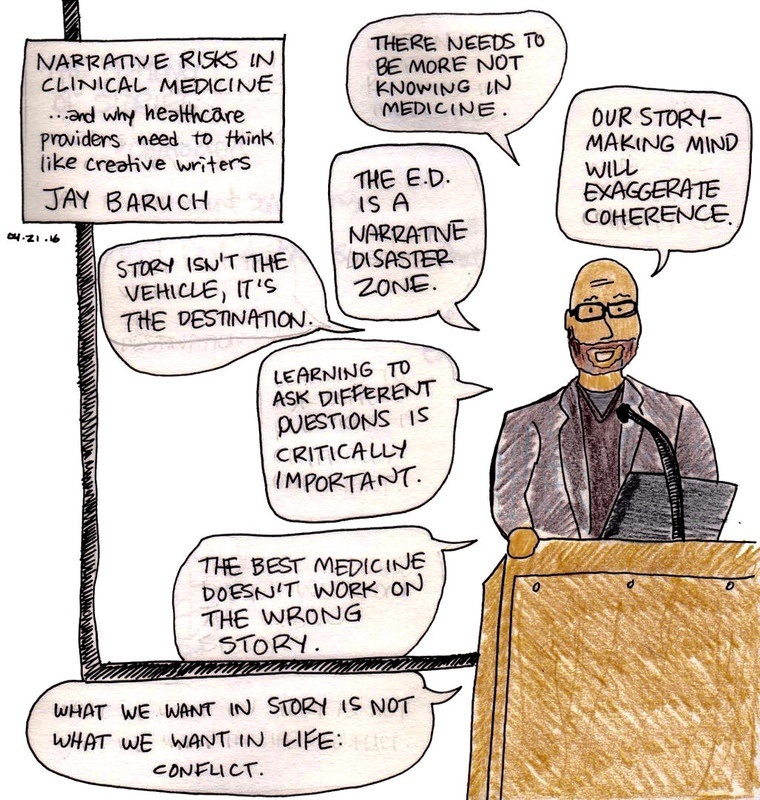 4/21/2016 “Narrative Risks in Clinical Medicine,” Montgomery Lecture, Feinberg School of Medicine, Medical Humanities Masters Program. Chicago, IL. 4/9/2016 Panel, “Integrating museum and medical education: a multidisciplinary panel. Health Humanities Consortium national meeting, Cleveland, Ohio. 11/17/2015 MedEdTalks2015 Alpert Medical School at Brown University: From Museum to Bedside: The Need for Museum Educators in Medical Education. 10/23/2015 American Society for Bioethics and Humanities national meeting, Houston, TX part of panel presentation "Beyond Consent: Ethics of Reality TV in the Hospital"
10/1/2015 Duffy Lecture in Medical Humanities, Yale School of Medicine "Why doctors should write creatively, or, why one doctor failed at 'not' writing." 4/15/2015 "What’s Left Out: Meeting the surreal in medicine through fiction. Cogut Center for the Humanities, Brown University. 3/11/2015 Distinguished Visiter, Creighton University Medical School, “Narrative Risks in Clinical Medicine: Why Healthcare Providers Should Think Like Creative Writers.” Omaha, NE. 3/11/2015 Speaker, KANEKO, “What’s Left Out.” Omaha, NE. 4/23/2014 Ethical issues in writing about the medical experience. Southern Oregon University Honors College students. 4/24/2014 Why physicians should think like creative writers. Assante Regional Medical Center, Medford, Oregon. 4/26/13 Millenial Medicine: Knowledge Design for an Age of Digital Disruption, Houston, Texas. 4/18 and 19/2013 Reading and discussion on writing and medicine with the wonderful people at the Cleveland Clinic Lerner College of Medicine, Northeastern Ohio Medical University and Hiram College. 1/11/12 UMass Medical School, Lamar Soutter Library 5pm. Talk and reading, "Medicine and Fiction: Writing Your Way into Trouble," sponsored by the Humanities and Medicine Committee of the Lamar Soutter Library. 4/16/08 College of Physicians/Society for the Arts in Healthcare Philadelphia, PA.
2/19/08 Humanities Perspectives lecture. “Pulling the Hat Out of the Rabbit, or Creating Fiction Out of Medicine.” Brody School of Medicine, East Carolina University, Greenville, NC. 3/28/06 Distinguished Visitor, Haverford College, Haverford, PA.